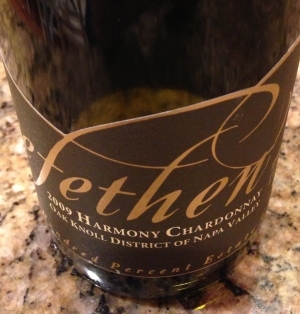 "Harmony" is Trefethen's reserve chardonnay, and the 2009 vintage is a stunning example of how good California chardonnay can be. If you're like me, you don't drink a lot of this varietal. There are so many interesting white wines on the market these days, now that the dominance of California chardonnay seems to have subsided somewhat. From crisp whites like Clarksburg chenin blanc to floral whites like roussanne and viognier, grown increasingly in regions like the Sierra foothills, California white wines offer consumers a much broader range of flavors today. Moreover, the buttery, toasty style of California chardonnay became a tiresome cliché, something to be avoided – not only because it was overdone, but because too often it wasn't done well. Too much new oak combined with overripe, low-acid fruit, accentuated by malolactic fermentation resulted in wines that quickly tired the palate. For these reasons I have mostly avoided chardonnay recently. But every once in a while you encounter one that surprises you, renews your interest, gives you hope. For me, Trefethen 2009 Harmony Chardonnay is one of those wines, a chardonnay that is stunning not for its intensity but for its balance and, yes, its harmony. This is a beautifully integrated and polished wine that deftly brings together the elements of fruit, oak, acid, texture, and finish. Gorgeous and elegant in its presentation, like a Vivaldi string quartet. A wine that can be appreciated on its own but by no means sates the palate or makes food pairing impossible. The only down side is the price. This wine is available on Trefethen's website for $50. That's not crazy expensive, but the price means that for most of us the 2009 Trefethen Harmony Chardonnay is a wine for a special occasion. If you do indulge however, do so soon. This is not a wine to hold for many months or years. It's beautiful right now and should be tasted at its peak. * Note: Photo borrowed from the Trefethen website.